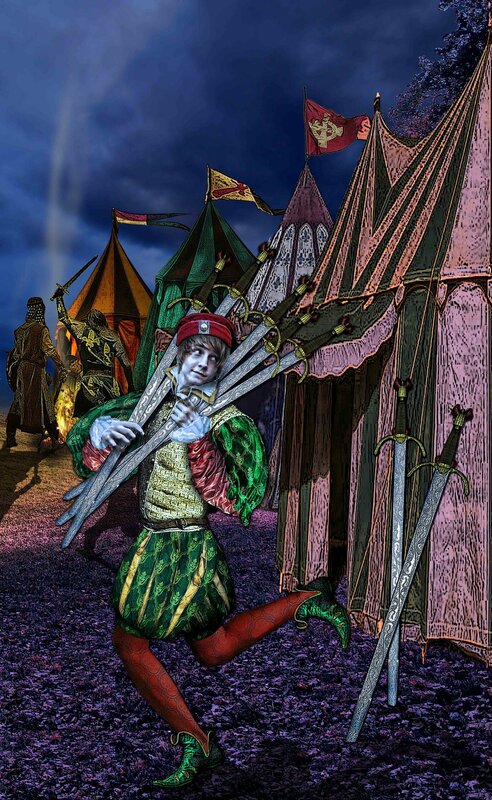 The Seven of Swords has long been a card that I couldn’t quite connect with. I understood the “standard” meaning, that the card indicates someone who is being deceptive or isn’t being honest and forthright about their intentions, but often I didn’t find that meaning to resonate so much when it came up in my readings. Since I use tarot primarily for personal development and inner work, I like to find meanings that apply and resonate with those themes. Of course we can deceive ourselves and we can certainly have warped intentions, but there was a piece that wasn’t clicking. That is until I spent some time pondering who exactly this character was that is skulking about absconding with swords. 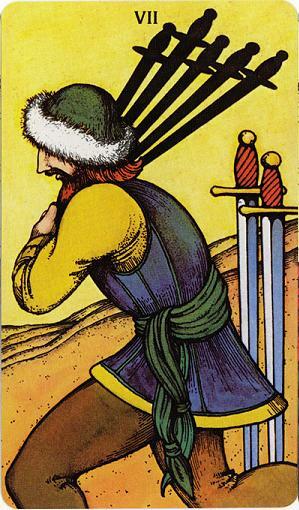 The character in the Seven of Swords can be anyone, depending on the context of the reading, but the person who I most often associate him with now is that devious little creature that lives inside most of our heads, The Inner Bully, the Inner Critic, the part of yourself that isn’t very nice or supportive to you. I also call them the Inner Party-Pooper because everything that they have to say is such a buzz kill. And what are they stealing? Only some of the most precious things that we possess, our ideas, our self confidence, our joy. This character really is a piece of work. They are the one that when we have a great idea, just shoots it down with some BS about “that’s too hard.”, “You aren’t clever enough to do that.”, “Everybody else is already doing that.” What a jerk! If you have a resident Inner Bully, I know you know EXACTLY what I’m talking about.